Harvest when approximately 40% of the flowers are open. From the Greek meaning “ending strife”. Named after King Lysimachos of Thrace (360-281 B. C.) who is said to have calmed a bull with a piece of loosestrife. 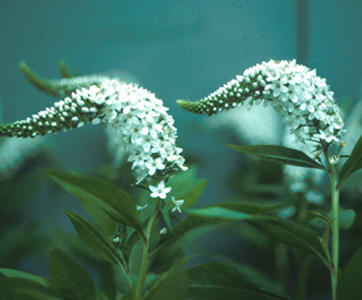 Lysimachia punctata has larger yellow flowers in looser clusters. In the garden, perennial members of this genus tend to be invasive. Harvest when flowers are 40% open. Reid (2000) demonstrated that flower food effectiveness varied greatly depending on brand name compared to plain tap water and a bleach/tap water solution.